Think back to the last construction or maintenance project at your hospital. Were you nervous about infection control problems? Wondering if you’d installed all the necessary control measures? Probably. But it seemed like the only option was to cross your fingers and pray that everything went according to plan. One of the most frustrating things about infection control is that you’re fighting an enemy you can’t see. How are you supposed to know if your patients are actually protected when you can’t even see the threat in the first place? By measuring the trouble-causing agents at the source. Particulate monitoring can measure how much dust is escaping from construction work area containments, so you can correct the problem before patient health is put at risk. 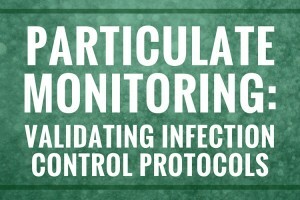 Here’s how particulate monitoring can help you determine whether your infection control protocols are working sufficiently over the course of your construction and maintenance projects. Construction and maintenance activities pose some of the greatest risks for releasing dust into the hospital environment. Increased traffic, activity, and vibration during construction and maintenance projects can dislodge dust particles and release them into the air. That dust can lead to pretty scary infection control problems. That’s why infection control protocols and containment barriers need to be put in place to control dust during construction and maintenance projects. If containment measures are not effective, dust can escape and travel to just about anywhere in the hospital—including high-risk patient areas like ICU’s, operating rooms, etc. But, if we can control the dust, we control the problem. Why do we care about dust? Dust is made up of all sorts of particles. Many of these particles are harmless, but some of them can cause fatal infections or illnesses. At the same time, even harmless dust particles pose a risk of becoming a vehicle for smaller infectious agents. You see, while some particles are large enough to travel on their own, smaller agents must latch onto larger dust particles to become airborne. Once that dust is airborne, infectious agents can go wherever the dust goes. Now you’re probably wondering: what infectious agents I need to watch out for? We’re exposed to mold and fungal spores every day. They can be found indoors, outdoors, on your clothes, behind walls, above ceilings, and everywhere in between. That’s because mold can grow just about anywhere there is moisture and a food source—and molds are not picky eaters. They can feed on just about any organic substance, including wood, paper, carpet, and glass—or even stainless steel in a dusty environment. And if it has the chance, mold will feed off your internal organs too. Since mold can eat just about anything, the major determining factor for mold growth is water. Mold spores can remain active for up to 12 years, and any contact with moisture can set off mold growth within 48 hours. Mold can make its way into hospital environments in a variety of ways: through open doors and windows, with occupants as they enter the building, or even through HVAC air intakes. Once mold is introduced into circulation, it can still be filtered out through the HVAC system. But if mold spores settle in and start to grow, it can lead to some serious indoor air quality and infection control problems. To start, mold regularly emits fungal spores into the air as it reproduces. Increased activity and vibration during construction and maintenance activities can disturb mold, causing even more mold spores to be released into the air. Some of the biggest healthcare construction risks result from hidden mold growth behind walls and under finishes. These problems are often discovered by accident when workers tear up building materials during maintenance projects or pre-demolition surveys. At that point, it’s too late to contain the countless mold spores that have been disturbed and released into the air. Like mold, bacteria can survive on their own as free-living organisms, or they can become parasites that feeds off of a living host. While some bacterial strains only cause minor infections, some strains can cause incurable or lethal diseases, especially in immunocompromised patients. Many bacteria have the same survival requirements as mold (access to food and a moisture source). As such, they can be found just about anywhere. For example, bacteria might be found living in wall cavities, in water systems and cooling towers, in the spaces above ceilings, or on surfaces in patient rooms. Once bacteria enter a hospital environment it can be hard to get rid of them. Many airborne bacteria particles are too small for filtration systems to remove, so they remain in the air indefinitely. Some strains have also become resistant to antibiotics and cleaning solutions, making them difficult to eliminate from healthcare environments. Viruses need a host to survive, so they lie around our environments all the time just waiting for a host cell to come along. If that doesn’t work, they can latch onto larger airborne particles until they find a suitable host. Viruses can be spread through sneezing, coughing, exhalation or blood contact. They typically enter the body through inhalation or a break in the skin. Most viruses are even smaller than bacteria, making them even harder to remove from indoor air circulation. High-Efficiency Particulate Air (HEPA) filters can be an effective means of eliminating these pathogens from high-risk patient areas. The most harmful agents are small enough that we can’t see them with the naked eye. That’s part of what makes infection control so hard. Particles 40 microns and larger are visible to the naked eye. (For reference, a human hair is about 80 to 100 microns in diameter.) But most particles fall between 3 and 5 microns in size, making them impossible to detect without specialized equipment. It doesn’t help that the smallest particles often pose the biggest health risks. Particles that are 2.5 microns and smaller are tiny enough that they can bypass all your body’s physical barriers when you breathe them in. That means they go straight to the bottom of your lungs where they can enter the bloodstream. Viruses (.005 to .3 microns) and smaller bacteria (.5 to 2.5 microns) fall into this category. But tiny particles aren’t the only problem. Courser particles measuring 2.5 to 10 microns can still make their way into your “deep lungs” and cause serious health problems. Larger bacteria (2.5 to 5 microns) and mold spores (3 to 12 microns) are both small enough to take up residence inside your lungs. We’ve established that if we can successfully keep dust from escaping construction work area containments, we can limit the transportation of infectious organisms to other parts of the hospital. Ideally, infection control containment measures should keep particles from escaping the work area. But it’s difficult to determine the effectiveness of these measures because most particles are invisible to the naked eye. Particulate monitoring provides a solution to this problem by allowing us to detect migration of these particles and correct infection control protocols before disaster strikes. Particulate monitoring uses particle counters to measure dust concentrations in the air. These measurements can be used to evaluate relative indoor air quality or validate infection control protocols. What’s the point of conducting particulate monitoring? It identifies existing infection control issues that need to be considered. It helps assess the effectiveness of hospital protocols for infection control during healthcare construction. It ensures that dust control measures surrounding construction and maintenance projects are working. It demonstrates that the hospital is protecting patients. When does particulate monitoring take place? Particulate monitoring should take place over the course of your construction or maintenance project. That means from the time that demolition work begins through the final clean-up and dismantling of containment measures. But wait! Even before demolition begins, a baseline assessment should be conducted to gain information on pre-existing particulate concentrations. The assessment should take place over three consecutive days prior to the start of any work. A quick note on demolition: Hospitals oftentimes make the mistake of not considering the demolition stage as part of the construction project. But this is one of the most important times to use infection control containment measures and conduct particulate monitoring. Demolition and dismantling of building materials cause vibrations that can release loads of dust into the air. Not to mention the risk for uncovering hidden mold during the demolition process. If particulate monitoring is going to be used to assess infection control protocols during construction, a baseline assessment should be performed over three consecutive days before any work begins. How does particulate monitoring work? Particulate monitoring involves taking daily samples of indoor air around the exterior of the work area. Particulate levels are assessed using a handheld laser particle counter that measures the concentration of particles in the air (as opposed to counting individual particles). Sampling locations generally include: dust containment walls, ingress and egress openings, and ante rooms. Outdoor air samples are also collected to determine the %Difference. 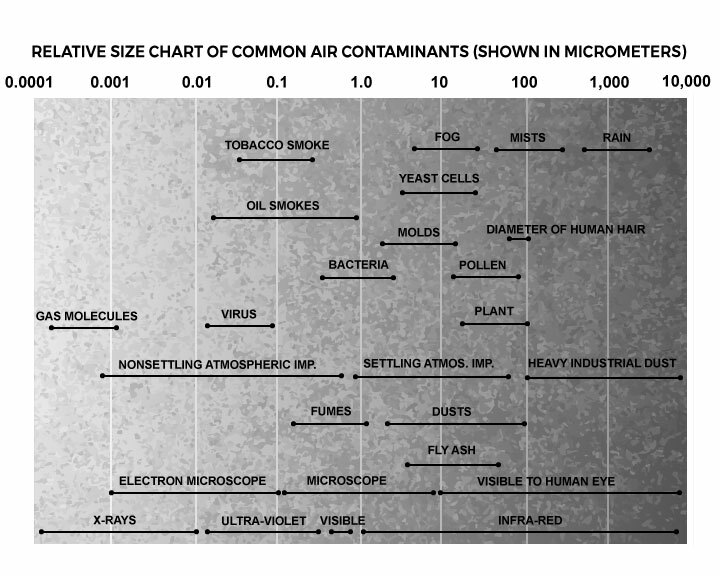 The difference between concurrent outdoor air particulate concentration and indoor air particulate concentration at specified locations. This %Difference can be found using an equation that puts indoor and outdoor particulate concentrations in relation to one another. This is done to account for the filtration of outdoor air by the building’s HVAC systems. The equation helps us determine the amount of particulate generation/recirculation within the space, or in other words, the concentration of airborne particulates. Indoor particle concentrations should be measured at least once a day, during the same two-hour period of the work day. The locations where measurements are taken should remain consistent for the duration of the project. As we mentioned, the %Difference is a function of the indoor air filtration provided by the building’s HVAC system. This means that the normal threshold for indoor air particulate concentrations will depend on the filtration system and the efficiency of the filters used on outdoor air prior to circulation. The person conducting particulate monitoring should be familiar with the filtration system in place at your hospital so they can account for the effects of filtration efficiency on indoor particulate levels. For example, HEPA filters are 99.97% efficient at removing tiny (0.3 micron) particles from the air and limit recirculation of particles. If a building uses HEPA filters, high particulate counts would indicate that dust is escaping from a containment area. On the other hand, a low efficiency filter will remove fewer particles and will allow greater recirculation of those particles. These high indoor air concentrations will affect %Difference calculations and increase the threshold for normal indoor particulate concentrations. Outdoor air particulate concentrations must also be taken to calculate the %Difference. Outdoor air sampling should be conducted daily during the same two-hour window when indoor air particulate levels are measured. For outdoor measurements, it’s also important to sample particulate concentrations at the same location every day. For large, multi-story healthcare facilities, it’s best to measure outdoor air particulate concentrations from several locations, ideally on opposite sides of the building. Make sure the locations you choose are situated away from obvious contamination sources (like loading docks or idling vehicles at hospital entrances) so that the concentration threshold is not higher than what it would be normally. Superficially high outdoor air particulate concentrations will skew %Difference calculations, making it difficult to identify significant variations that would indicate a dust containment problem. Outdoor particulate concentrations constantly fluctuate with the weather, season and time of day. These changes will directly affect the %Difference, so the person conducting particle monitoring should always take note of outdoor weather conditions. These observations will help them determine whether some big variation between %Difference measurements is due to a weather change, or an actual infection control containment problem. Infection control containment measures can be assessed by comparing particle concentrations and identifying differences in the measurements. If containment measures are working correctly, the concentration measurement should remain about the same from day to day. A big deviation in the %Difference from expected levels (based on the baseline assessment) would indicate that dust is escaping from the containment area. It’s recommend that a buffer zone of +/- 10% from the baseline assessment be allowed to account for outdoor air fluctuations. For example, in most cases an increase (%Difference) in particle concentration greater than 25% percent will usually point to a dust containment problem. More and more hospital owners, managers and contractors are using particulate monitoring to validate construction infection control protocols and to identify infection control risk areas in their hospitals. For infection control protocol validation, a baseline assessment is conducted prior to the start of demolition. Daily particulate monitoring around the containment area is then conducted for the duration of the construction or maintenance project. The Industrial Hygienist (or the person conducting the monitoring) then calculates the %Difference and watches for significant deviations between measurements. If a significant variation occurs, containment barriers are assessed and fortified to prevent dust from escaping in the future. Ongoing particulate monitoring has also been helpful to hospital owners and managers in assessing more general infection control protocols, like proper HVAC function and pressurization systems. These systems are essential to protecting high-risk patients from harmful dust, bacteria, molds, and other particulates. By collecting data about particulate concentration, hospitals can demonstrate that they are successfully controlling indoor air contaminants that could be harmful to patients. In some cases, ongoing particulate monitoring has even helped identify mold growth by pinpointing hospital areas with higher particulate concentrations. 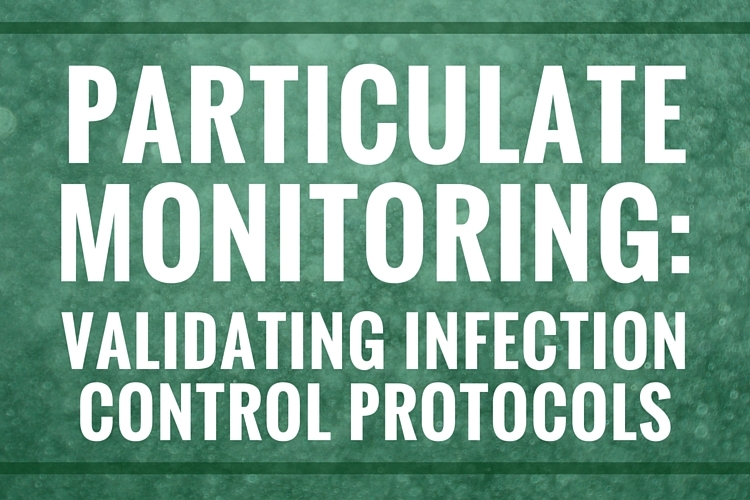 All in all, while infection control might sometimes seem impossible, there are several ways you can evaluate your protocols and ensure patients safety—and particulate monitoring is one of them. If you have any questions about particulate monitoring or how to use it in your facility, please do not hesitate to contact me. I can help you establish particulate monitoring for your next construction or maintenance, or as an ongoing validation of infection prevention protocols. As president and chief executive officer, Dan focuses on the overall direction of the firm, strategic alliances, and business development, while upholding his commitment to clients to ensure their projects' success. He remains involved in the field, applying his 30 years of experience to resolve the most complicated and high risk environmental hygiene issues encountered in healthcare facilities.